Next message (by thread): [FPSPACE] Those brave Soviet space dogs, a brief history. Paul Drye posted: " What it was: A two-astronaut shelter/living quarters for use with the Apollo program once it had progressed to needing 30-day stays on the surface, studied in 1966-67 by Garrett AiResearch at NASA's request. Variants for three astronauts and for a mobil"
The Garrett Early Lunar Shelter, showing its roots in the LM Truck and, in turn, the LM that actually landed on the Moon. The tanks draped around it are hydrogen and oxygen for the fuel cells, shelter pressurization, and recharging the astronauts' suits after EVA. Public Domain image via NASA from Early Lunar Shelter Design and Comparison Study, Volume IV. Click for a larger view. What it was: A two-astronaut shelter/living quarters for use with the Apollo program once it had progressed to needing 30-day stays on the surface, studied in 1966-67 by Garrett AiResearch at NASA's request. Variants for three astronauts and for a mobile version that could be hitched to a lunar rover were also examined. In 1966, NASA commissioned Garrett to move beyond what they'd done to that point, and work on a  full-fledged, if tiny, Moon base. Dubbed the "Early Lunar Shelter" (ELS), the intention was to build it following the J-Class missions—what turned out to be Apollo 15 through 17. Having progressed from short surface stays like Apollo 11 to longer ones that had a lunar rover to work with, like Apollo 17, the next step was to be month-long stays and that required more than a single LM. >From the beginning, the Moon landings had been quite restricted in mass, as much of an LM was taken up with astronauts, the consumables they needed, and the fuel and engines needed to get them back to the CSM for the flight home to Earth. If you could forgo all of that with an automated lander, you could haul a lot more equipment to the Moon—to wit, 4.67 tonnes of it. 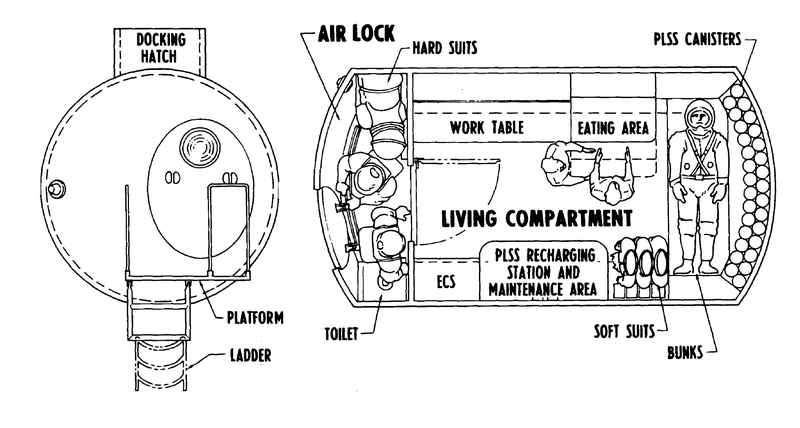 There were any number of configurations for the LM/T, constrained only by the volume an LM occupied on top of a Saturn V and the limit to the mass it could safely land, but the Early Lunar Shelter was the answer to one particular question: "Suppose we devote the Truck's volume entirely to living quarters for two astronauts and the scientific equipment they'd use. What would that be like?" What Garrett came up with was a stubby cylinder, 8.1 feet in diameter and 16 feet long (2.5 meters by 4.9 meters) which rested on its side above the LM/T's descent stage, looking not unlike contemporary bathyscaphes. It would be launched atop a Saturn V along with a crewed CSM, which would dock to a on its upper ferry it to the Moon after the usual Saturn IV-B trans-lunar injection. After reaching their destination, the CSM would disengage and return its crew to Earth, while the ELS would land automatically. The shelter could sit on the Moon for as much as six months before its astronaut-dwellers arrived (thanks to another Saturn V/CSM combination), with a minimum seven days prior to their launch for checkout of the shelter. A SNAP-27 radiothermal generator would power the ELS until activation. Once aboard, the minimum time the astronauts would use it was assumed to be 14 days, with 50 days being the upper end of possibility. The first day days of the mission would be devoted to the astronauts activating the shelter for their use, unloading it, switching the shelter to running off fuel cells (which would also supply water) and transferring the RTG to their LM Taxi so their ride home could be deactivated but kept "alive" until it was needed at the end of the mission. The interior of the shelter was to be divided into two main areas. One was a lunar EVA airlock taking up one end, the CSM hatch on top being used solely for docking with a CSM. It would have been big enough for two astronauts at the same time as well as storage of two hard space suits. The bulk of the shelter was 628 cubic feet (17.8 m3) of living space. Though about half of this would be taken up with supplies, bunks, and spacesuit storage, its shirt-sleeve environment compared well with a regular LM's 4.5 cubic meters of habitable volume. Alternatively, as the Moon does supply gravity, the ELS can be sized another way: it would have had 68 square feet of floor space (6.3 square meters). The shelter was double-walled aluminum and fiberglass (the latter in the inside), with 58 mils (0.058 inches, or 0.15 cm) between them for meteoroid protection—the usual tactic, as invented by Fred Whipple. The other major danger entertained was radiation, and the aluminum walls couldn't be made thick enough to sustain 500 rads (a hypothetical solar flare) without weight close to a half ton more than was otherwise necessary. 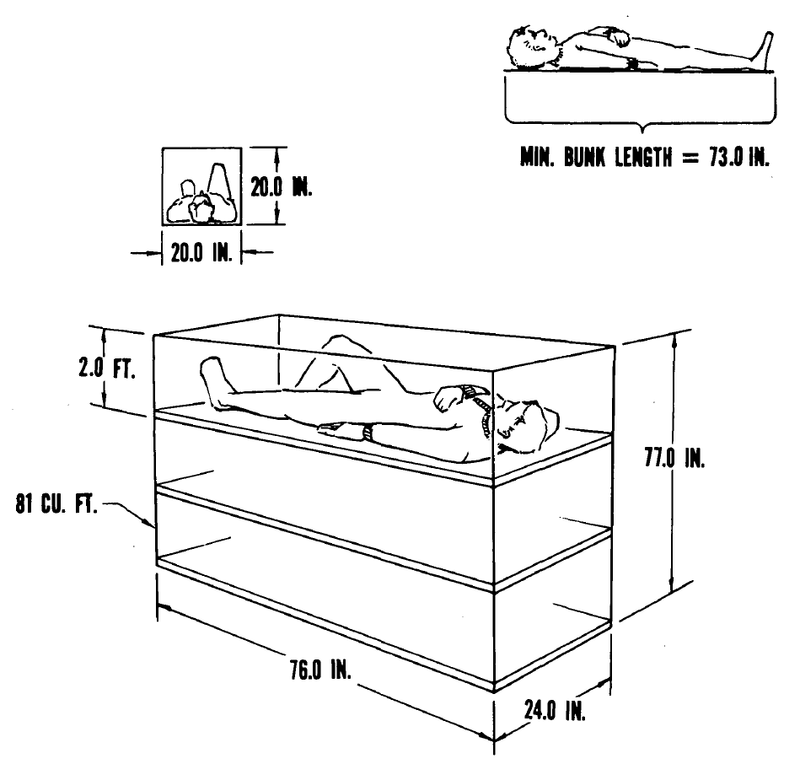 Accordingly the study suggested putting the necessarily numerous  PLSS recharging canisters (for the life-support backpack worn while on the surface) stored in water filled sleeves around the bunk area located at the opposite end from the airlock. Altogether, they, the walls, and the bunk material made an acceptable, if awfully cramped, radiation refuge for everyone on-board. Arranged around and behind the shelter were four tanks: one compressed gaseous oxygen, one liquid oxygen, and two liquid hydrogen. These weren't intended for use with the Truck's landing engine—it had its own tankage—but rather for use by the astronauts and the fuel cells (and so, accordingly, their water). Garrett pinpointed the storage of LOX and LH2 for up to six months before the astronauts arrived as the main technical challenge facing the ELS. Another issue was what atmosphere they would breathe: pure oxygen at 5.0 psia, or nitrogen/oxygen mix comparable to Earth. The former was desirable for mass reasons, and to keep the ELS as close in technology to the rest of the Apollo program as possible, but Garrett were concerned that there were no medical studies of a pure oxygen atmosphere for a long period of time; the 30-day maximum they note was apparently just an educated guess. They ended up punting the problem down the road as essentially an issue of how much they could keep the ELS from leaking; if that could be minimized, the problem was moot. Safety concerns weren't mentioned at all, and in fact the final filing of Garrett's study was on February 8th, 1967, not even two weeks after the Apollo 1 fire. After that the CSM would switch to a oxy-nitrogen atmosphere, though the LM would stay with the low-pressure pure oxygen. As well as being a shelter, the ELS would have been a miniature scientific outpost. It would be equipped with a drill capable of getting 100 feet down into the Moon's crust, carry explosive charges for seismic readings, and three remote instrument stations that would be deployed far from the landing site thanks to the extended EVA capability the shelter would provide. All told, the shelter would come with 3470 pounds (1.57 tonnes) of science gear, while the shelter itself was a remarkably light 985 pounds (447 kg). Add in the expendables and altogether it could be successfully landed on the Moon by the LM/T with a mere pound and a half to spare. Let it not be said that they didn't squeeze all the juice out of this one. 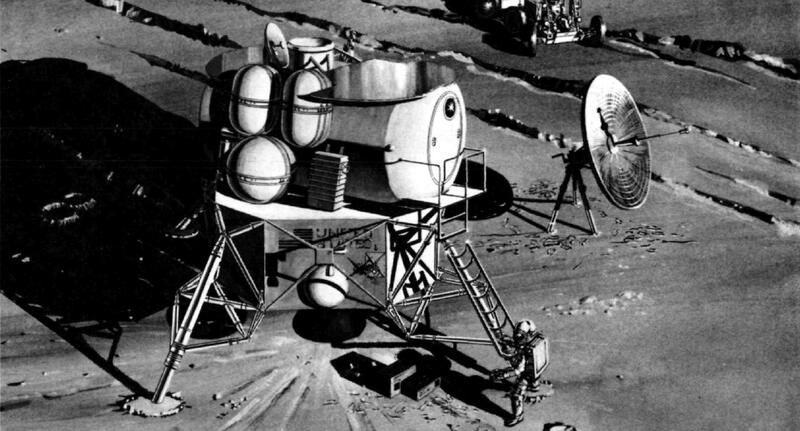 What was necessary for it to succeed: It's interesting to compare the Early Lunar Shelter to the other Moon bases we've examined so far, Barmingrad<https://falsesteps.wordpress.com/2016/08/21/barmingrad-the-kbom-lunar-base/> and Project Horizon<https://falsesteps.wordpress.com/2012/09/22/project-horizon-part-iii-landing-soldiers-on-the-moon-and-staying-there/>. Both were hugely ambitious and nowhere near happening in reality, while for this project the key word was early. A lot of people tend to conflate Moon bases with lunar colonies, or at least the next rank down of permanently inhabiting the Moon even if the personnel are swapped out periodically. What NASA put its finger on was that we're not likely to make that big a leap all in one go. The first lunar bases are probably going to be temporary, just like the first space stations were before we worked our way up to Mir and the ISS. On that basis it's easy to get the ELS to fly, as it was a big part of the logical next step in lunar exploration (ignoring the elephant in the room that was automated exploration, mind you). With probably no more than some minor redesigning there could have been one on the Moon just a few years after when Garrett AiResearch pictured it: 1972. As ugly as the post-1969 picture was for NASA's funding, it's not too much of stretch to see the three or four more necessary missions past Apollo 17 making it through the budget grinder and "Apollo ELS" flying sometime around late 1974 or early 1975. It's a lot likelier than much of what NASA proposed post-Apollo 11, at least, if only because one mission like that would be as much or more of a punctuation mark at the end of the program as any other mission bar Apollo 11 itself. Unsubscribe<https://subscribe.wordpress.com/?key=a9936435d2eec774465d9fd42a099e37&email=ljk4%40msn.com&b=f%3FchOQmqX%3F%2COx7%3FkQEMWkuXJRbZFHuFIWzm2gQV%25h%25K%5BU%25I%25%25%2C> to no longer receive posts from False Steps.